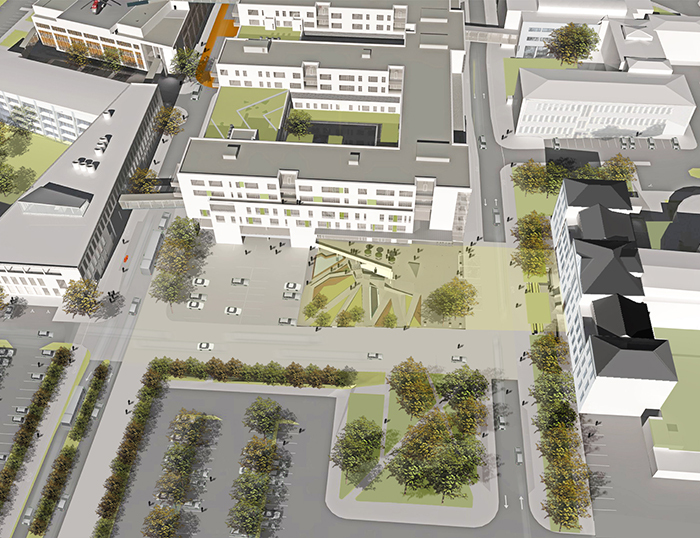 Landspitalinn treatment facilities is one of the largest and most complex design projects that has been undertaken in Iceland. 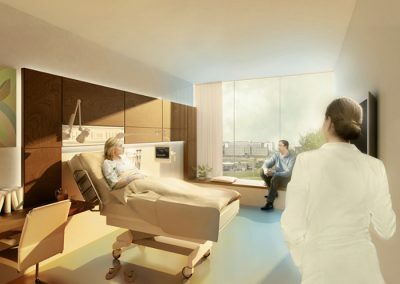 The building that will contain what most would define as conventional hospital activity, will be on six floors, with additional two basement floors. 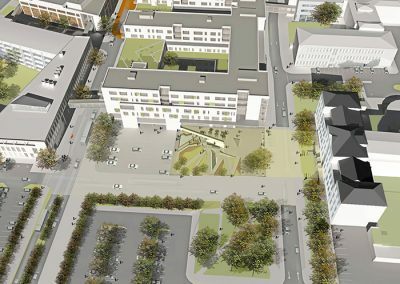 The work activity that will be located in the treatment facilites is today separated into several different buildings situated in the Reykjavik capital area, however the new building will house an emergency center, surgery unit, coronary and general angioplasty unit, intensive care, radiology, infectious diseases unit, inpatient unit and most other significant units found in a traditional hospital. 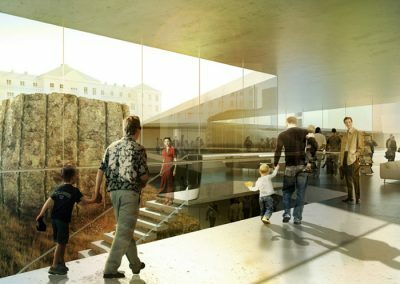 The design team Corpus3 is responsible for the design of this ambitious project, but the team comprises the architect firms Hornsteinar and Basalt, alongside the engineering firms VSO Consulting and Lota. In addition, several foreign specialists from Holland, Denmark, Norway and England take part in the project design. The building will accommodate about two thousand employees with diverse jobs and it’s crucial to create a motivating work place for this sizable and diverse group of employees which works to take care of sick people and nurse them back to health. Additionally, the patients’ needs have to be paramount everywhere and the environment must be mending for them. The nature of hospital work is both complex and varied and the functionality of the hospital is mostly decided in by how easy it is to move personnel, equipment, medicine, linens and so on between hospital units. The flow through the building has to be as practical as possible, so that too much time or steps are not spent in vain in the execution of the various assignments. Meanwhile, dissimilar work between floors and units that don’t complement each other has to be accounted for. The building will also be connected to other structures on the hospital lot, such as the research unit, outpatient unit and more, both above and below ground. It is therefore a considerable challenge to create a comprehensive machine that works perfectly, but it’s also an incredibly exciting and enjoyable project to handle. It will be an immense change for the personnel and the patients to have almost all services under the same roof, it will involve big savings of funds, be time-saving for all parties and increase safety. The team members of Corpus3 possess a great deal of experience which they have come by both in Iceland and other countries, and additionally the team attempts to adopt the best parts of hospital design from abroad. A great deal of development is happening in comparable facilities in the countries surrounding us, where emphasis is put on limiting all kinds of waste, such as time, chemicals, space, energy, and simultaneously reducing distances indoors. In reality it is a special kind of discipline how each unit of the building is put under the microscope to study how the staff goes about so internal travels can be reduced. For example, it has been observed that coronary angioplasties can be increased by 1-2 per day just by considering the transfer of patients to the surgery room. In this way the wait can be moved closer to the surgery unit, the preparation time decreases and as a result the number of surgeries per day can be increased. The emphasis of flow aside it needs to be kept in mind that hospital equipment evolves and changes rapidly. For this reason, it’s essential to design the building in such a way that it is flexible and able to change with time. In this way, a surgery room on one floor could be moved to another the next morning. The building is thereforen not defined by concrete walls and such, but rather the fact that the internal organization will unavoidably be altered throughout the years. This is a brand new idea and a great contrast to old hospital buildings, which are more set in stone. The involvement of security factors, such as for earthquakes, is also important and it holds the structure to a specific standard. The hospital needs to be functional immediately after a big earthquake, should it happen. For this reason, both the design and the location of the building in the city area need to be centered around that. The effects of an earthquake at Vifilstaðir, on the outskirts of the Reyjavik capital area, is for example much greater than at Hringbraut. Many analyses have been made and various parts have been revised in cooperation with the hospital personnel and its patients. The design will be user controlled with the goal of across-the-board collaboration with the user body, making the design process considerably more focused. This collaboration is surely more time-consuming, but the resulting design will be more concise and hopefully results in a better building. Although the design team is never the less responsible for the outcome in the end. 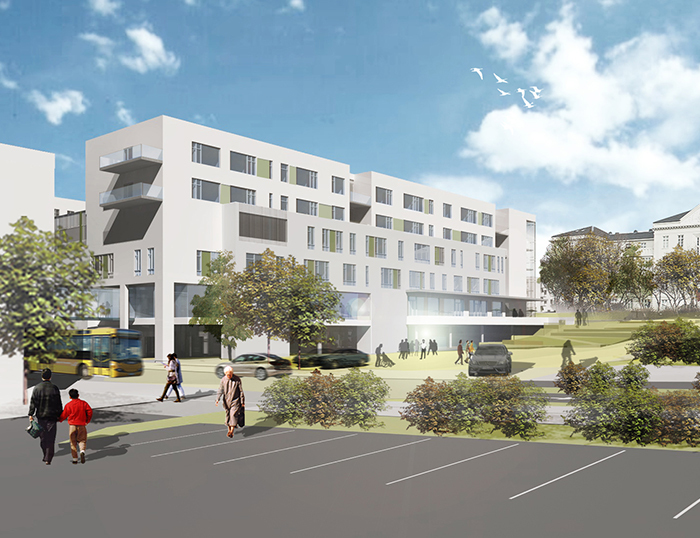 The treatment facilites will rise south of Hringurinn children’s hospital, where the old Hringbraut is located today. It’s estimated that constructions will commence in 2018 and that operations in the building can start in in 2023.